Most how-to articles on a given subject walk you through a series of steps, perhaps with a video attached. 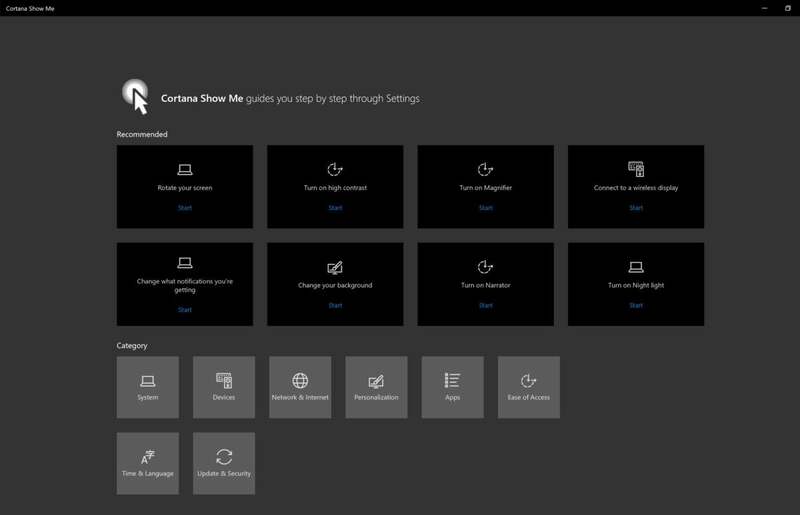 Windows 10’s new free help feature, Cortana Show Me, is different: It actually performs basic Windows tasks for you on your PC while you follow along. Even better, Cortana Show Me strikes a nice balance between showing you what to do, actually performing those steps, and providing an “escape hatch” if you need to slow down. 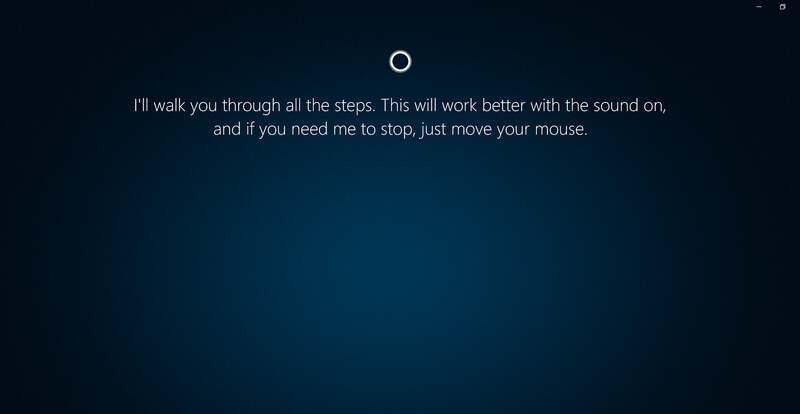 All you need to do is wiggle your mouse, and Cortana Show Me will stop. Microsoft’s free app is part of the Windows 10 April 2018 Update, and includes walkthroughs for many basic tasks—we have a full list below. Let’s be clear, though: Most advanced users won’t need to use Cortana Show Me. In general, if you’re familiar with the Windows 10 Settings, you’re already familiar with what Cortana Show Me can do. This is an app for users who can navigate Windows, but need some help diving deeper into what Windows can do. The only thing we wish Microsoft would change is Cortana Show Me’s implementation. Instead of building in Cortana Show Me as a bundled Windows 10 app, Microsoft annoyingly chose to make it a downloadable app from the Microsoft Store. That’s the sort of basic task Cortana Show Me’s user base may struggle with. Cortana Show Me is designed to walk you through common tasks audibly and visually, so make sure your audio is on. The quickest way to download Cortana Show Me is to click the link in this sentence (you’ll need to sign into your Microsoft account if you haven’t already). 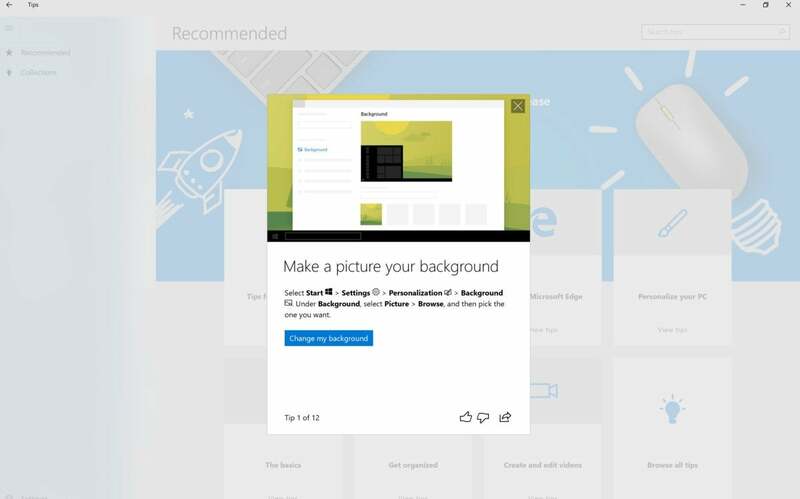 That will open Microsoft Edge, with a bright blue Get the app button. (For some reason, the Cortana Show Me app didn’t appear when I searched for it within the Microsoft Store app.) The app’s file size is only about 14MB, so it should download in a snap. Once installed, you can launch Cortana Show Me by clicking the app in your Start menu. 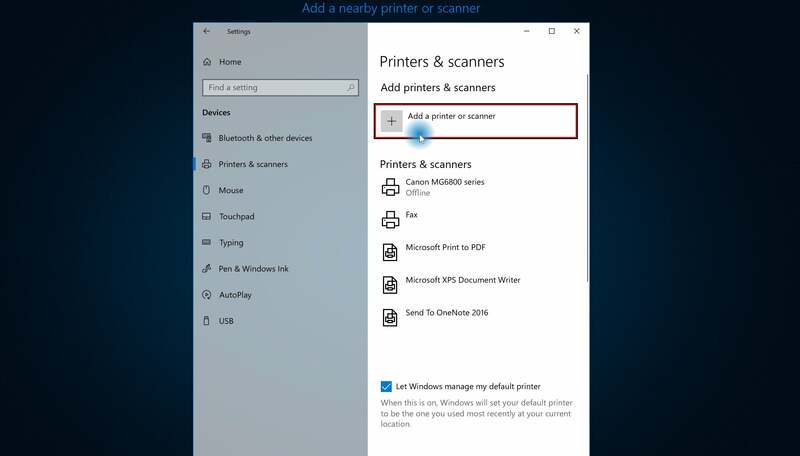 As part of the Fall 2018 feature update for Windows 10 (whatever it ends up being called) Microsoft plans to add voice controls, so you’ll simply be able to trigger your mic and orally order Cortana to, say, “show me how to change my screen brightness.” For now, however, you’ll have to select which tutorial you’d like to view manually. Cortana Show Me isn’t the most thoughtful app at present. It’s a rather dull collection of boxes at the moment, and there’s no introduction to welcome you. Upon opening it, the app displays a handful of the most common tutorials, along with a list of categories at the bottom to dive deeper. Cortana Show Me seems stuck in Windows 10’s dark mode for now. You can find more tutorials under the various categories, below. Clicking one of these tutorials, though, launches Cortana, with Jen Taylor’s familiar voice guiding you through your task. Cortana Show Me expands to fill the monitor that it’s launched in, with Cortana alerting you that you can pause at any time just by wiggling the mouse. 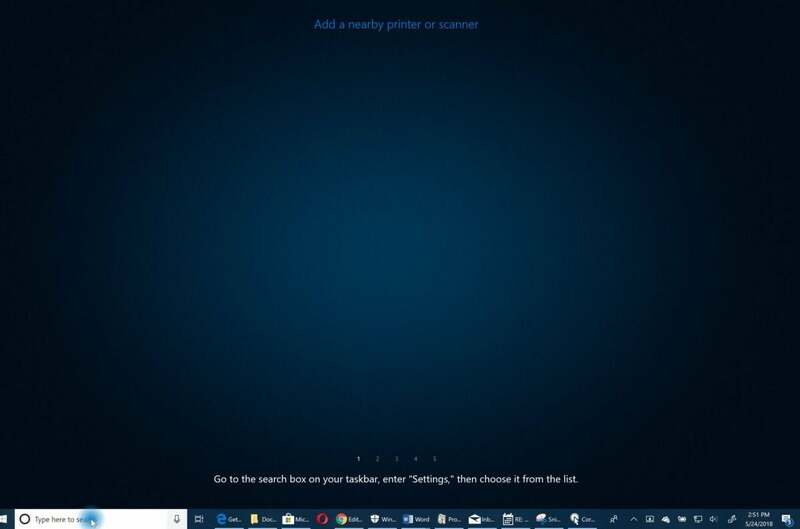 Cortana Show Me uses your actual desktop (including the taskbar), and will typically begin by launching the Settings menu. The magic of Cortana Show Me is that it doesn’t just appear that the app is moving your cursor—it actually is, even putting a little halo around it to make it easier to see. 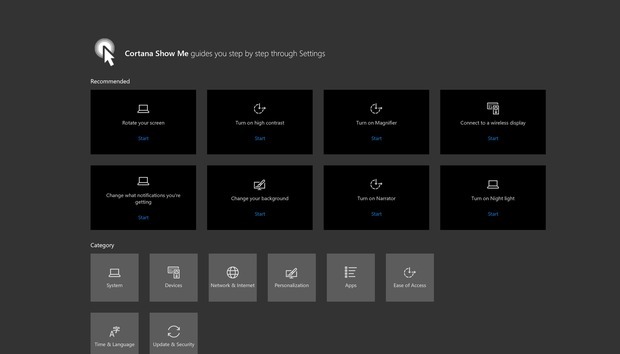 Virtually every tutorial begins with navigating to the Settings menu by way of the Cortana search box. If Settings is already open, Cortana Show Me will navigate through to the appropriate submenu. As Cortana Show Me navigates through the steps of, say, how to change your background, you’ll see what to click and what choices you’ll have to make. Each tutorial tends to last less than a minute, ending at about the time you’ll need to take some action, such as selecting the appropriate Wi-Fi router from a list of nearby devices. Menu items are automatically highlighted as the cursor moves over them, which is surrounded by a halo. What tutorials does Cortana Show Me offer? How could Cortana Show Me be improved? Cortana Show Me isn’t the only how-to app within Windows; the built-in Microsoft Tips app provides much more concise explanations of how to perform similar tasks. At times, Microsoft seems paralyzed, torn between placating a user base that demands constant improvement without altering the familiar way in which Windows works. But encouraging new users to find their way within Windows is an important responsibility, too. With Cortana Show Me, Microsoft has clearly built a framework that could be pushed as far as it likes. Some, more-complex content works better within the framework of a video, such as creating a detailed scene within Paint 3D. But simpler creative tasks, such as dropping an augmented-reality dinosaur into a photo taken with Mixed Reality Viewer, is well within Cortana Show Me’s capabilities. For now, though, Cortana Show Me serves an important niche: freeing you up from playing tech support at family gatherings. Instead of trying to teach a cousin how to set up a mobile hotspot, simply make sure they have Cortana Show Me installed, then grab another slice of pie. Why not let Cortana do all the work?